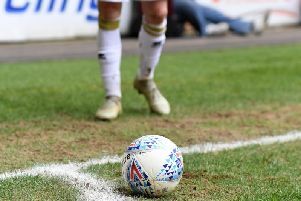 MK Dons turned in one of their worst performances in recent memory as they slipped six points from safety after losing 1-0 to Oldham Athletic on Tuesday night. Anthony Gerrard's header from a set piece six minutes before half time was the difference between the two sides, but Dons' abject and lost-looking performance did little to encourage the hopes of remaining in League 1 this season. Chuks Aneke returned from his three match suspension to play for the first time under Dan Micciche as one of three changes to the side from Saturday's defeat to Portsmouth. Robbie Muirhead was also handed his first start in a month, while Ethan Ebanks-Landell also returned. Kieran Agard, Callum Brittain dropped to the bench while Peter Pawlett missed out through injury. But Aneke's return would last just 14 minutes. After an early strike to test Johny Placide in the Oldham net, he went down with a suspected hamstring problem and hobbled off, replaced by Kieran Agard. His first involvement in the game though would be detrimental, inadvertantly sending Ike Ugbo's goal-bound shot wide of the mark. Oldham though should have taken the lead on 18 minutes when Lee Nicholls parried Ben Pringle's shot into the path of Craig Davies, but with the goal gaping, he fired wide of the mark. Neither side really got on top on the bobbling surface, with the home side restricted to some speculative efforts but it took a set piece to give Oldham the lead. After Ousmane Fane's shot was deflected out for a corner, Anthony Gerrard rose highest to power home a header past Nicholls six minutes before the interval. The second half didn't make for any better viewing. Dons looked second best to every ball, and struggled to keep control of it when they did eventually get it on the ground. Agard made next to no impact leading the line, while Upson's bad evening was cut short on the hour mark as he was replaced by Marcus Tavernier. But that made little difference to the proceedings. The visitors barely caused a ripple in front of goal, unable to pick their passes or cause any issue for Placide in the second period - arguably one of their worst of the season.